There have been a lot of problems with compatibility of custom builds when upgrading from TFS2010 to TFS2012. This blog post is my attempt to summarize what you have to do and how to fix some issues you might run into. The very first step is to upgrade your Server. Your build machines should match the version of your server. If you need Visual Studio on the build machine, install VS 2012 on the build machine. You will probably want to keep VS2010 on the build machine as well. This shouldn't cause any problems. The next step is to recompile any custom activity assemblies that this build machine uses to target the 4.5 .net framework and the version 11.0.0.0 Team Foundation assemblies. Remove all TeamFoundation references and replace them with the ones that ship with Visual Studio 2012 (the version number should be 11.0.0.0 - NOT 10.0.0.0). ALL assemblies in the custom assembly location for a 2012 controller should be compiled against the 11.0.0.0 versions of the TeamFoundation assemblies. Finally, you should be able to test your build definitions. It's hard to identify all the combinations here, but if loading your custom types causes Team Foundation assemblies of the wrong version to be loaded then the editor will not work as desired. Note that in Visual Studio 2012, you should be able to edit other parts of the definition, just not the process parameters that cause errors. After upgrading your templates and custom assemblies as described above, you will only be able to edit them in Visual Studio 2012. If you install both Visual Studio 2010 and 2012 on the same machine, make sure you install them in that order: 2010 and then 2012. Opening a template in the VS 2010 Worflow Designer on this machine will not work without changes to the template. It will attempt to load the 2012 Team Foundation assemblies as well as the 2010 versions which will cause errors when it tries to evaluate any types. There's really nothing wrong with the actual template. If you have to have the designer working in 2010 on a machine with 2012 installed, you can change the namespaces in the XAML file to use the full assembly name including the version information. But I wouldn't recommend this, since it will have to be removed for the template to work in 2012. If you get the following error when building your definitions against a recently upgraded build machine, you should restart your build machine service from the TF Admin Console on the build machine. 'DynamicActivity': Expected an input parameter value of type 'Microsoft.TeamFoundation.Build.Workflow.Activities.BuildSettings' for parameter named 'BuildSettings'. I am not sure what caused this error when I did it, but the fix was pretty simple once I figured it out. UPDATE: Several customers have continued to get this error after upgrading even though they restarted their build service. It turns out that these customers had fixed most of their custom assemblies but not all. If you continue to see problems like this one (even intermittently), it means that there is still a build definition that uses assemblies/activities that are compiled against the 10.0.0.0 assemblies. Once the error starts, all subsequent builds fail because the old assemblies are loaded into the build services memory. Only restarting will resolve this issue. If you get the following error, you didn't update ALL your custom assemblies to reference the 11.0.0.0 versions of the TF assemblies. Validation Error: The private implementation of activity '1: DynamicActivity' has the following validation error: Compiler error(s) encountered processing expression "DropBuild AndAlso BuildDetail.Reason = Microsoft.TeamFoundation.Build.Client.BuildReason.ValidateShelveset". Type 'IBuildDetail' is not defined. If you get any errors like these, the XAML file probably still contains some versioned namespaces. Validation Error: Compiler error(s) encountered processing expression "New Microsoft.TeamFoundation.Build.Workflow.Activities.BuildSettings()". 'BuildSettings' is ambiguous in the namespace 'Microsoft.TeamFoundation.Build.Workflow.Activities'. Validation Error: Compiler error(s) encountered processing expression "Microsoft.TeamFoundation.Build.Workflow.Activities.CleanWorkspaceOption.All". 'CleanWorkspaceOption' is ambiguous in the namespace 'Microsoft.TeamFoundation.Build.Workflow.Activities'. Jason, thanks, it clears up a lot of the confusion :). Or at least explains why it is confusing. Don't forget that binding redirects work in some cases. This is especially helpful if you are unable to recompile your custom assemblies to v11. Quote: "Since we’ve maintained public APIs compatibility between releases, this approach should just work. You should be aware that this configuration will not let you load any other version of the redirected assemblies." Just to be clear: does this mean that if we need a 2012 build machine (to take advantage of the 2012 C++ compiler) we must first take steps to migrate from TFS 2010 to TFS 2012? We were hoping to incrementally move to 2012 by moving developer machines and build machines first before tackling the issue of migrating our 2010 TFS to 2012. I just need to be super clear on this because it has the potential to drastically change our approach to 2012 adoption. Clarity: For all versions of TFS up to and including TFS 2012, the version of the build machine MUST match the version of the TFS server that it communicates with. So, YES you have to upgrade your server and your build machines at the same time. We are trying to decouple the server and build machines, but it hasn't happened yet. I get the TF215097 dynamic activity error all the time. I restart the build service and it goes away for a little bit, but then it comes back. Annoyingly, it didn't do this when I set this up in my test environment. Most likely, you have some XAML or custom assemblies that have not been upgraded. Once those builds are run, subsequent builds will be "contaminated". Try looking for the builds that cause the error or perhaps the ones that succeed just before you see the error. Unrecognized tag 'x:Members' in namespace 'schemas.microsoft.com/…/xaml&…..
for 3 of the 4 XAMLs that are included in the solution. 1. We are staying with TFS2010 for now. XAML activities can be tricky. I am not sure what's wrong with yours, but open them up in notepad and compare them to the one that works. I'm confused – if we use TFS 2010, can we have one build server that builds VS 2010 solutions and another that builds VS 2012 solutions? I gather the build server itself is still a 'TFS 2010' build server, but only has Visual Studio 2012/.NET 4.5 installed and will only be building 2012 solutions. But then if we want to upgrade to TFS 2012, what happens to the build server that's needed to build VS 2010 solutions? Can TFS 2012 build server still be dedicated to only building VS 2010 solutions? Basically, the build server for VS 2010 solutions needs to be impacted as little as possible so we can build patches etc. for our existing products with no risk – I certainly wouldn't want to put .NET 4.5 on it. We are working on a solution for this problem. The "upgrade" of .net from 4.0 to 4.5 is causing many customers problems and keeping them from upgrading. We hope to have a solution soon. Thanks for letting us know how you use the product. Jason, we have a 2010 server in the corporation but use visual studio 2012 in our group to develop. Can I setup a team build for our project or do I have to wait till they upgrade to TFS Server 2012? I setup a tfs 2010 controller on a VM but it's not going smoothly. The target framework 4.5 is not listed in the dropdown for the project properties and also I dont see v4.5 on the path C:WindowsMicrosoft.NETFramework64 of my server . System.IO.FileNotFoundException: Could not load file or assembly 'Microsoft.VisualStudio.SharePoint.WorkflowExtensions, Version=11.0.0.0, Culture=neutral, PublicKeyToken=b03f5f7f11d50a3a' or one of its dependencies. The system cannot find the file specified. If you are using VS2012, you should be able to work with an older server. However, you will probably have to figure out how to get VS2012 on your build machine to build anything that targets the latest .net framework. This may include pointing the MSBuild activity to the new framework's MSBuild.exe. I am really not sure what other problems you might right into. Are you using Visual Studio 2012? The .net 4.5 framework should be the latest one if you have VS 2012 installed. Sorry, I couldn't help more. I am not sure if everything "just works". The change in Update 2 was to allow 2010 build machines to run against a 2012 server. Hopefully, you will get your errors worked out. We recently upgraded our TFS to 2012 and we are getting error tf14064 and we are unable to figure out whythis is. Any help would be appreciated. Hi John, this is better handled by support. I am not sure why you would get that error after upgrading. We are getting the exact same error about "out of range of valid values. Parameter name: column"
Does anyone have any ideas on this. Again, we have 2010 build agents and controllers and TFS 2012 with latest updates. 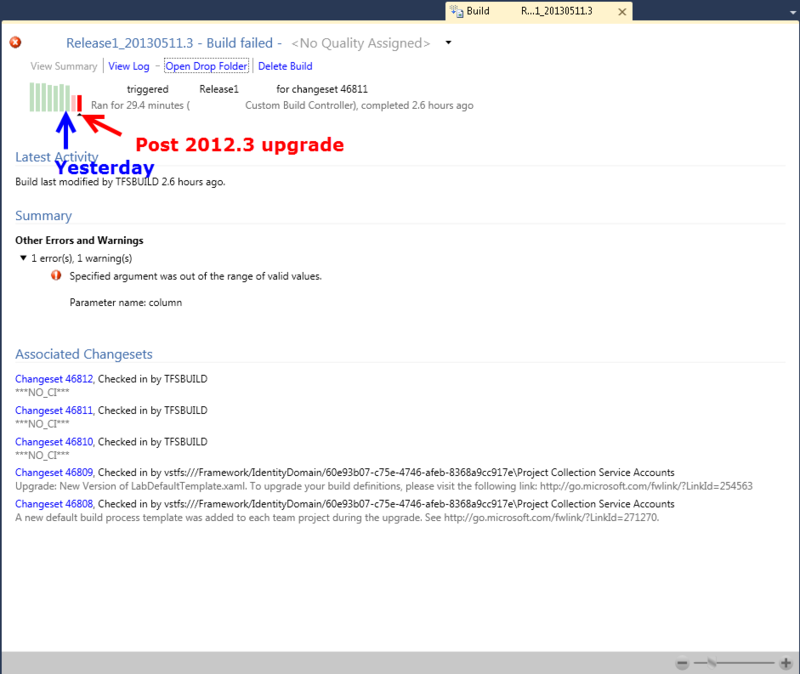 This is a known bug that we discovered near the end of development for TFS 2012.3. However, we did include it in the final version of Update 3. If you still experience the error after you get the final version of Update 3, please file a bug against TFS on Microsoft's Connect site. The only workaround in the mean time is to turn off the UpdateWorkItems flag on the AssociateChangesetsAndWorkItems activity. This will cause workitems not to be associated with the build. Sorry we didn't catch this bug sooner. Yep, when upgrade TFS 2010 to 2012 update 2, we got the same error "out of range of valid values" as well. We did the same workaround by turning off AssociatedChangeset and let the build succeed once. After that, we turn it back on and everything work as normal. Say if MS fix this in Update 3, which we don't want to upgrade right away. We have a lot of customization and it costs a lot of time to test and validate the system, especially builds. Hopefully, we will go directly to 2013 sometime. By the way, we have alot of Server 2003 and we still stuck alot of Build Service 2010. We will have to upgrade to Server 2008 next before looking for future TFS. Recently my TFS moved from TFS2008 to TFS2013 and my projects are still in VS2010 and .net 4.0. By reading your post, is not possible to use VS2010 and .net 4.0 projects with TFS2013 and migrate the old build definitions to the new TFS2013? The projects must upgrade to VS2012 and .net 4.5 and create new builds definitions, yes? The TFS 2013 server supports talking to the 2010 Build Machines to build 2010 solutions and projects. I have a customized 2010 Build Template. Is it possible for me to convert this template to 2012 template? If so how can I do it? The best approach is to diff your changes with the 2010 template and then see how those same changes can be made to the 2012 template. We don't have any way to simply migrate it to 2012. That said, the 2010 template can be made to work on 2012 as is. We are running TFS 2010 and just recently upgraded a test build machine to run .net 4.5.2 with TFS 2010. This required us to install VS 2012 and now when we are running our 2010 build definition, we fail with this error among others related to other work item types. The build process failed validation. Details: Validation Error: The private implementation of activity '1: DynamicActivity' has the following validation error: Compiler error(s) encountered processing expression "wit.Project.Name = "Support"". Type 'WorkItem' is not defined. I have narrowed this down a build activity called If AssociateChangesetsAndWorkItems. if I remove this activity, the build is successful, if it is there, it fails. Under the VS/TFS 2010 build machine, it works fine with the If AssociateChangesetsAndWorkItems activity in place. Under the VS2012/TFS 2010 build machine, it fails with the If AssociateChangesetsAndWorkItems activity in place, but works if it is removed.